The old 308 System is one of my favorite shapes in the Peterson catalog. It’s an original Charles Peterson patent shape (#14), by which I mean it’s found in the 1896 and 1906 catalogs and was a regular in the shape chart until its last official appearance in the 1947 chart. It continued to be a favorite here in the United States and was featured in several of the Rogers Imports catalogs and brochures in the 1950s. I have two 308s and a 14s, and all three were made after 1949, bearing the MADE IN over THE REPUBIC over OF IRELAND country of manufacture (COM) stamp. I had originally thought the 308 was probably deleted from the catalog sometime in the early 1960s, although as I said, it doesn’t appear in any official K&P ephemera after 1947. (I have more stories of this wonderful shape, but they’ll have to wait for the book.) Jorgen Jensen read the original version of this blog and (as you can see in the comments), remarked that he bought a new 308 Premier (not new/old stock) at the Grafton Street store on 29 July 2001. I contacted Tony Whelan, Jr., the following day, and he replied that, to the best of his recollection, the 308 was still being made in the late 1990s. This corroborates Jorgen’s belief that it was in fact a new pipe. This opens up a new can of worms, one which is worth pondering. At this point, I can only say (as I say in the manuscript of the book) that just because a shape doesn’t appear in the catalog, doesn’t mean it’s not still in production at the factory. I suspect the reason for the 308’s demise was simply that it was too much like the 312. It certainly has nothing to do with its smoking qualities. It’s the more upright of the two shapes, with a longer back-to-front at the base of the stummel, but a bit shorter crown. But it’s also got a wider mortise bore, which for my money is the reason it makes a better System smoker. But that’s just my opinion. When I saw this old 308 on Ebay, I fell in love with it because (a) it is a 308, my favorite System shape after the 309; (b) it’s a sandblast, which I’d never seen before, and (c) the unusual blast pattern made me wonder if it was strawberry wood. 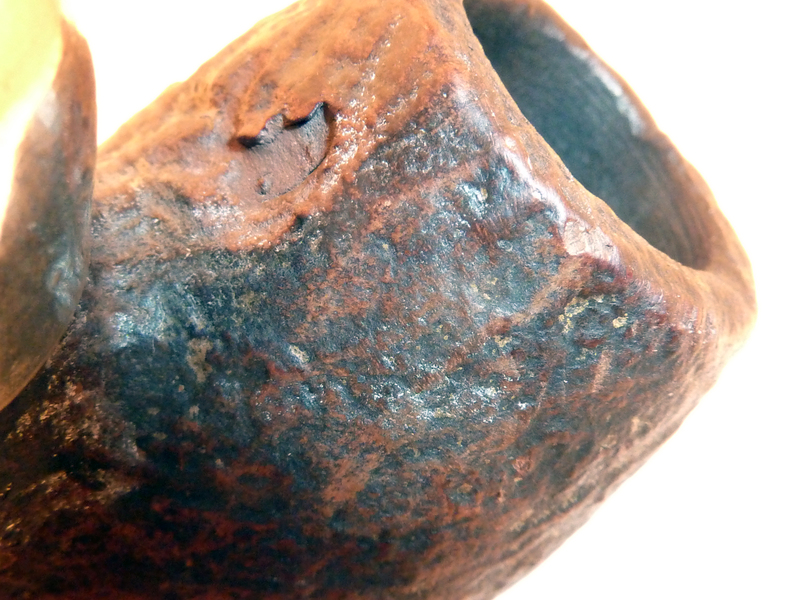 The asking price was a bit steep for its condition, but the pipe looked solid under the oxidation and grime. I’ve been told that strawberry burls are sometimes harvested unknowingly alongside the briar, and my very sweet experience with a Peterson 02 Shamrock Oom-Paul made of strawberry wood has kept me on the lookout for another Peterson strawberry. I’m told that one way to recognize strawberry wood is in its blasting pattern, which tends to go into lunar circles and pits rather than the rings typical of briar. When the pipe arrived, I found the stem frozen into the mortise, so I popped it into the freezer for a few hours, after which it came out without much difficulty. The tenon as well as the reservoir had a white, odorless coating. 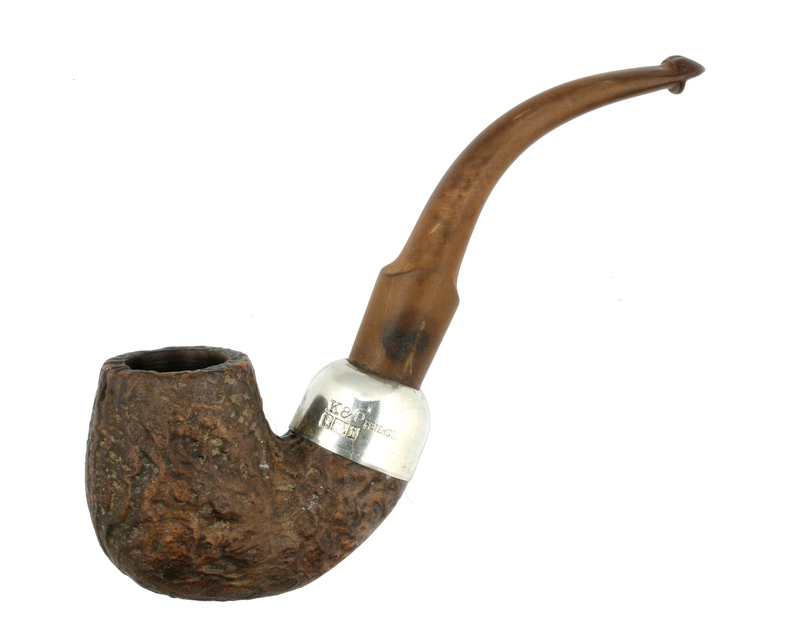 The bowl had no tobacco smell, but smelled a bit of mildew, so it had probably been decades since the pipe was smoked. The indentations on the upper part of the P-Lip show some wear, but by a dry smoker, from the looks of it. The draft hole shows considerable build-up, making me believe a tobacconist may have begun reclaiming this pipe at some point years ago, then set it aside. As sometimes happens, the stem has straightened out a little over the years, probably the result of being set in the sun for an extended period at some point. There is no scorching or rim-darkening at the bowl top. I’m wondering if at some point the pipe wasn’t subjected to partial attempt at stripping the finish. It was a surprise to find the large fill on the back of the bowl, and I confess a bit of a disappointment. 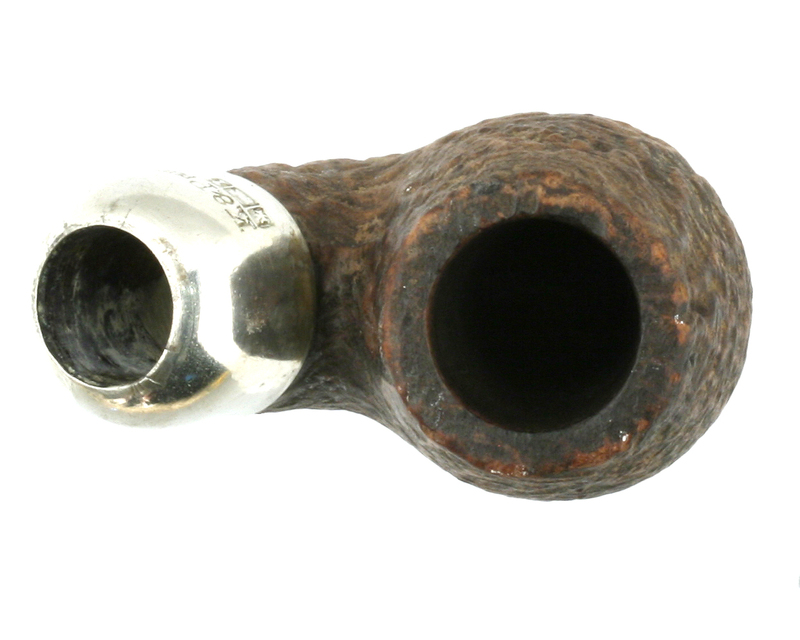 However, my Shamrock 02 had a few of those, one of which had fallen out, and it is one of my Magic Pipes, so I shan’t complain but remember yet again the moral of Hawthorne’s tale “The Birthmark.” For Peterson, sandblasting has always been a way to reclaim bowls marked with pits. I want to draw attention at this point to just how wide the mortise is in a 308 System—15.10mm on this one (.594 in)—bored all the way down, with no smaller extended reservoir at the bottom as is typical of the 307, 309 and other Systems. I have a hunch that this gives the shape an edge in its smoking qualities over its 312 rival, but it’s just a hunch. The ferrule has an interesting set of tiny cracks, which extends to the wood in the mortise underneath it. It received a fairly good blow at some point. The ferrule obviously did its protective job here, and while crack in the wood will probably never expand, I may fill it with glue if it looks like it needs it after cleaning. I will also try to press down the cracks, which stick up just a tiny bit. The ferrule is pressed nickel, not sheet nickel rolled and silver-soldered, which means the pipe was cut after about 1963, according to artisans at the factory in Sallynoggin. This is interesting, because the 308 was seemingly not a popular shape for Peterson after World War II, except in the United States, where it was promoted regularly by Rogers Imports. As I said at the outset, the shape’s last appearance in the official K&P ephemera was in the 1947 shape chart. It didn’t appear in the 1945, 1950 or 1965 Catalog brochures, although it did appear in the Rogers Imports catalogs of the 1950s. 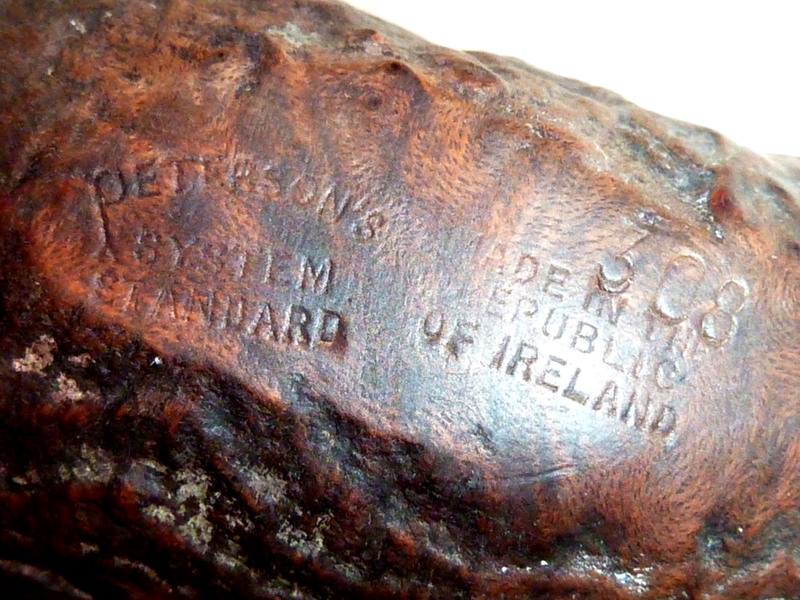 In any event, the bowl is stamped with the familiar three-line MADE IN THE over REPUBLIC over OF IRELAND stamp, so it’s a Rogers-Era pipe. The best sweetening method for a System bowl I’ve found is simply to submerge it in 91% isopropyl for several hours, so this was my first step. I always put a cotton oval pad over the top to keep alcohol in contact with all parts of the bowl, as the bowls tend to want to float, leaving an exposed area. Like everyone else, I’ve used the salt-slush / alcohol method for years, and still do when I’m concerned to preserve the outer finish or stain of a bowl. But even with 3 or 4 treatments, the salt – alcohol method doesn’t sweeten the bowl nearly as well in my opinion as 3 to 4 hours submerged in an alcohol bath, and with a System pipe the reservoir is one of the most important parts to sweeten. After the bowl dried from the alcohol bath, I reinserted the (still unrefurbished) stem and took a few puffs. This is my test for how sweet the bowl will be. All I could taste was sweet wood—no ghosting from former tobaccos. There is no way of knowing precisely what color the original bowl was—beyond “brownish”—although it looks a bit like it was a contrast stain. I decided to use a 50/50 mix of Fiebing’s burgundy and Fiebing’s orange stains diluted by about 50% with alcohol. This gives it a red-brown hue, although it will also pick up the original stain left on the bowl without the raspberry highlights of the burgundy. 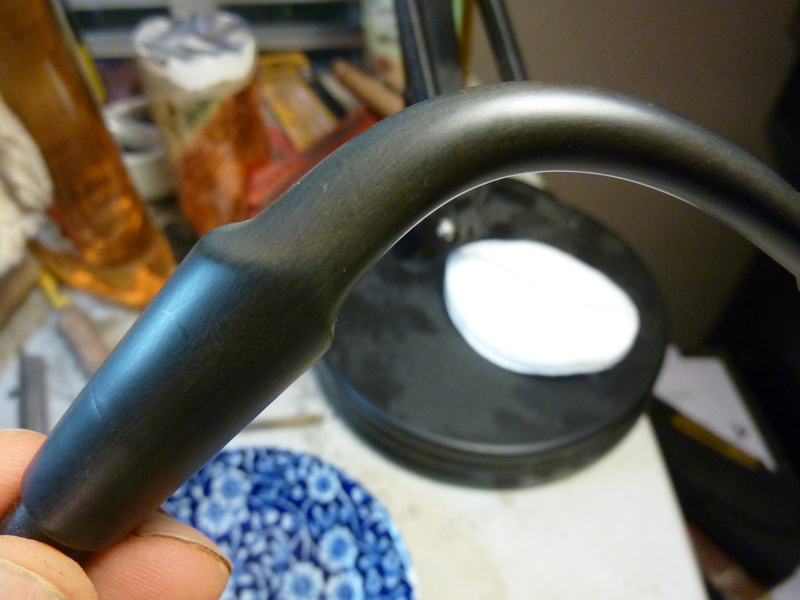 I didn’t burn in the dye on this pipe, as I wanted as much grain to show through as possible. 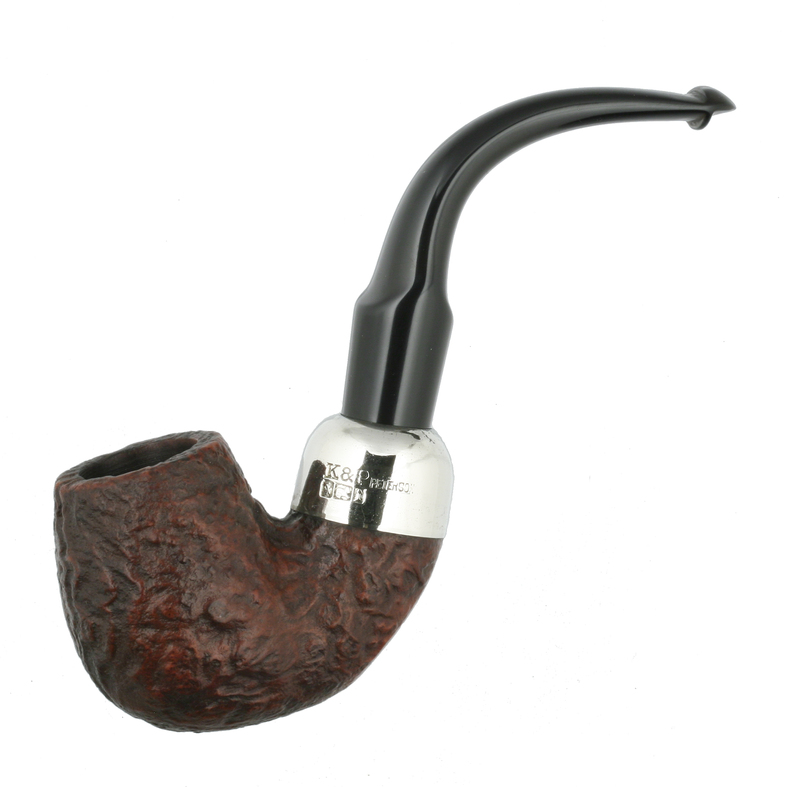 I’ve always used my Senior pipe reamer to stain bowls, adjusting it to hold the bowl in place with a piece of cotton pad wrapped around the blades (and protect the chamber from any stain). I can hold the reamer in one hand and stain with the other, then insert the reamer into a beer bottle after flaming the stain or (in this case) to allow the stain to dry. I also won’t follow the dye with anything but wax. Because it’s a sandblast, running carnuba over the bowl under the buffing wheel won’t work, so I rubbed in two coats of Halcyon II wax with my fingers, buffed it with a cotton cloth, and then ran it under a clean buff on the lathe at a fairly low speed. 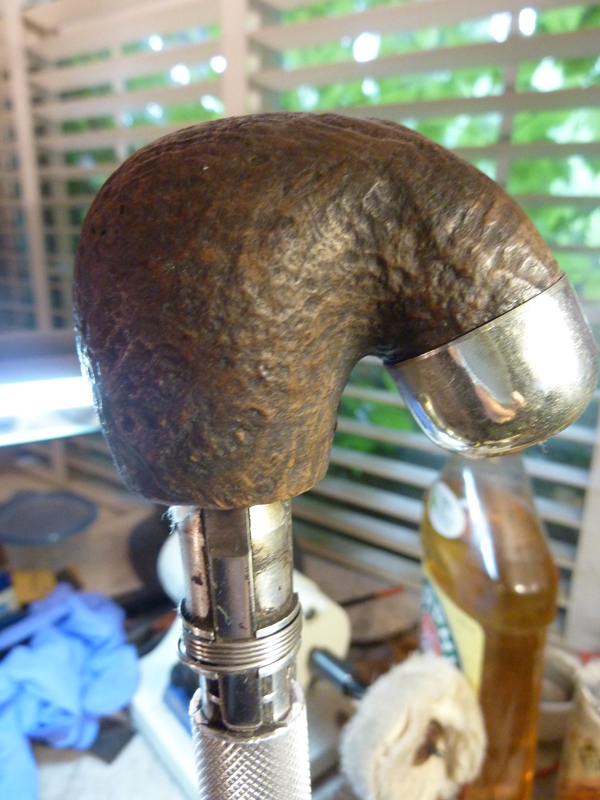 This gives it a soft glow, and in my experience with earlier restorations, the finish and glow will remain. As I said earlier, the stem has straightened over the years, probably due to exposure to prolonged heat at some point, so it needed to be rebent. There are at least two full-scale illustrations of a correctly-bent 308 stem, one in the 1906 catalog and one in the 1937. You can see the difference in the following pictures. The reason Systems come “unbent” over the years has to do with the “Peterson bend,” which we talk about in the book. What I needed to do was figure out which bend to use. The shoulder of the military saddle is taller (farther way from the mortise) in the 1937 catalog. 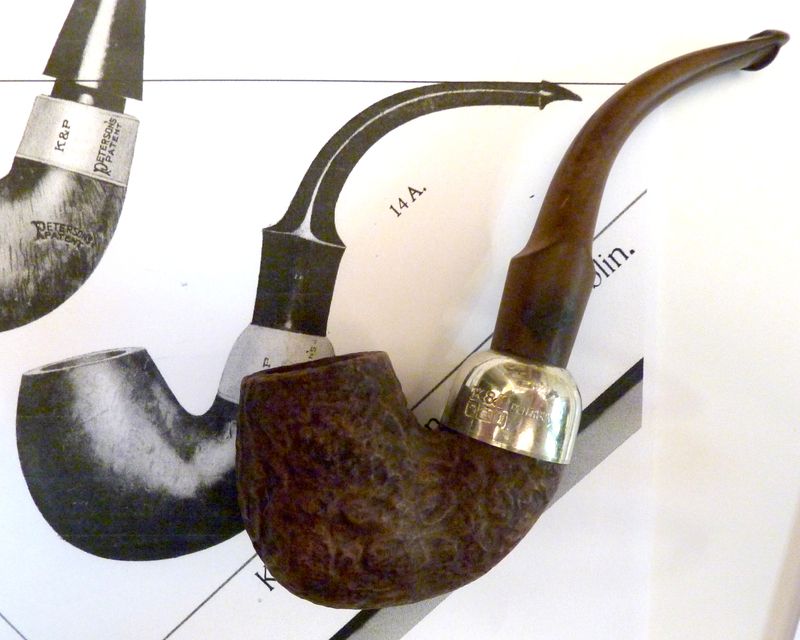 The stem in my pipe is actually identical in saddle height to the 1906 stem, as you can see, so that’s the one I go for. It took me two attempts to get the bend you see below, and while it’s not 100% perfect, it’s good enough for me. I’ve learned from bitter experience to use the lower setting on the heat gun, and just be patient for the vulcanite to get pliable. After bending, I submerged it into a bowl of ice water. The bite out of the button accounts for part of the illusion of downward movement just there. Another thing you have to be careful of when rebending is making sure the button is aligned horizontally to the bowl. I’ve seen a lot of System stems with a slight lift on the right hand side (when viewing the button dead on), which is caused by the bender being right-handed! 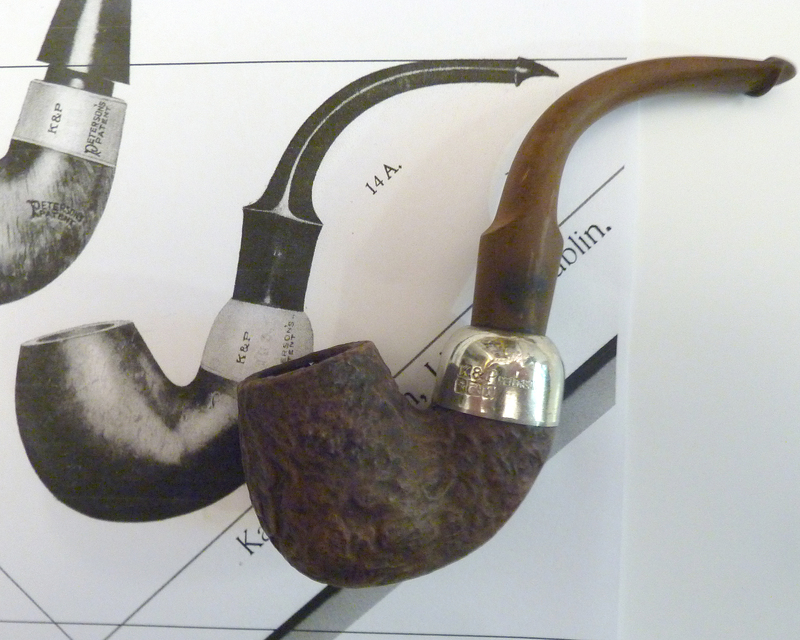 We often forget just how much hand work goes into a Peterson. Stems are hand-bent, by sight, and it isn’t surprising that there should be slight variations or imperfections in them. The top of the button had a small bite, as did the shelf in front of it, not to mention massive oxidation. 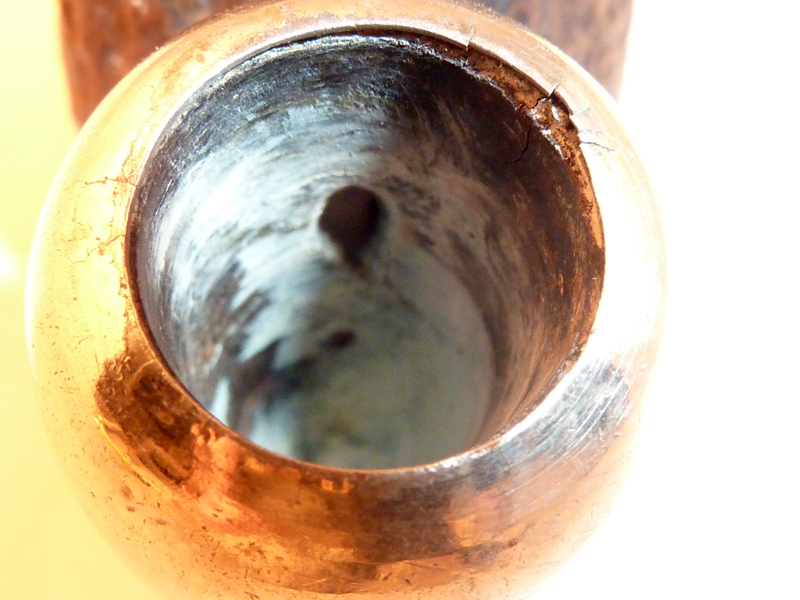 The oxidation isn’t surprising, since the pipe could be as much as 65 years old. I worked over the rounded top of the button just a bit to smooth out the top bite marks, but I didn’t fill it, just softened the offense. I did use a needle file to restore and deepen the upper button cut, then smoothed it out with 400grit wrapped over the file. A well-cut P-Lip should be exceedingly comfortable when clinched, with a place to stick your tongue in the lower shelf and easy clinching walls on the top and bottom of the button. For me, there’s no substitute for simply sticking it in my mouth and seeing how it feels as I work on it. I soaked the stem in bleach for 30 minutes before getting to work on it with Micromesh pads. I think Steve Laug pretty much just uses Oxyclean anymore, because the bleach often raises tiny bubbles in the vulcanite. I’m choosing bleach because I need it to cut into the sulfurized surface of the vulcanite deeply, or when I’m finished the stem will show areas of a light brown haze under an Ott light. I love a real “back-to-black” finish. 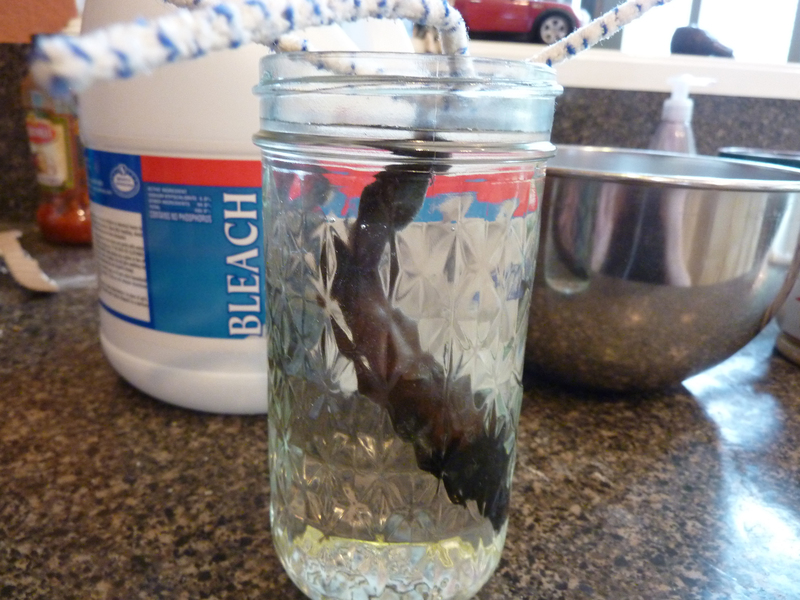 I always hang my stems in a small canning jar of bleach. It’s important not to let the stem touch the side of the jar–if it does, that area will not be bleached, as I’ve learned the hard way! Thirty minutes in bleach didn’t raise any micro bubbles under the loop, but produced a fine textured surface which was too difficult to cut through with Micromesh 1200. So I went back to a 500 grit sanding sponge, followed by a 1000 grit. This did the job, leaving me with a uniform gun-metal stem. I followed that with every grade of Micromesh up to 12,000. I forgot to use Steve’s trick of Obsidian oil after every three grades, which would have made the work go faster, but I was listening to a good audiobook, so I didn’t mind the mind the extra time. Following the Micromesh, I put it under the buffer with White Diamond. I used to opt for Fabuluster, but White Diamond seems to move things along a little faster. I followed the White Diamond with Obsidian oil, which I left on about 20 minutes before hand buffing with a cotton rag. The only issue with the ferrule was the micro-cracks, which I simply bent down on my cutting board. I used Fabuluster to clean it up, and it looks probably better than when it left the factory. I say better because nickel caps like this often aren’t finished very well, and the Fabuluster gives them a brighter, cleaner surface. Superb job there Mark! Question: you mentioned “method for a System bowl I’ve found is simply to submerge it in 91% isopropyl for several hours” – do you mean the entire bowl, completely covered by the alcohol? Doesn’t that raise the stamping? I use the salt/alcohol, including in the mortise, but dislike the harsh salt taste for the subsequent first few bowls. I have “dunked” bowls that I plan to restain and the immersion did not harm or alter the nomenclature. Hi Linwood! I wasn’t clear–I meant I submerge the bowl in alcohol, not the salt / alcohol slush. Great question about raising the stamping, too. I’m looking at it right now, and no, the stamping doesn’t appear any different than it did before. What an outstanding write-up Mark. An excellent combination of restoration techniques and historical data. I agree with you, when appropriate an alcohol soak is a sure method of eliminating ghosts, a reset of sorts. That was also a good tip on hanging the stem suspended. Thank you! I always look forward to learning something new from your blogs. Great looking 308. I’ve yet to acquire one , but I own 3 358s. What exactly is the difference between the 308 and the 358? Your input would be very much appreciated. Jorgen already answered this, but this shape had 3 numbers–the 14 (DeLuxe), the 308 (which would be today’s Premier) and the 358 (today’s Standard). The 3rd quality numbers were eliminated sometime in the 1940s. The 358 became the 308 after the elimination of those 3rd quality numbers. Thanks for clarifying, however now I’m wondering if it were the equivalent to today’s premier, would it not have a silver ferrule as opposed to a nickel one? I’m still very much at the beginning of my understanding Peterson long and winding history. The info you provide is incredible, thanks so much for sharing your wealth of knowledge! Yes, the 308 would have had a sterling mount until it replaced the 358 (nickel) mount. Confusing without that 1937 catalog in hand. I would so like to reprint it, but we can’t until the book is released. After that–I hope we can make public everything that will help Peterson collectors. …and thank you for the compliment. I wish we could share more–but we will, asap. I’m eager to get my hands on the book (Thanksgiving or thereabouts I believe?) and am looking forward to everything that will be released afterwards as well, catalogues etc… This year is going to be grand! No 308 was 2nd quality – No 358 was the same shape in 3rd quality. Mark, I have over 100 Peterson’s (most older) Thanks for the history, and your method of refurbishing. It will come in handy in the future. Thanks Steve for re-blogging. Thanks so much, Dave. Steve’s site is remarkable, isn’t it? Jorgen: 2001? I wonder if it was new / old stock… I am always learning how the catalogs don’t reflect production. There was a 107 Shamrock on Ebay that just sold (from the 1950s)–it appeared to be the same shape as the one I discussed in an earlier blog–and which did not appear in the literature until the early 1990s! I am sure it was new produktion,not old stock. It was on the wall with other Premiers. qualities – restproduktion,but I do not think this one was more than 10 years old. 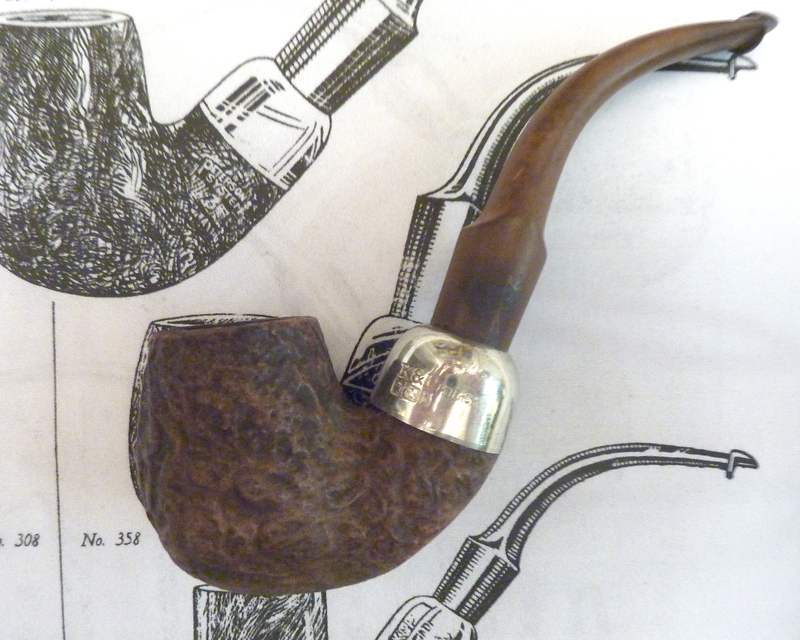 221 which was written as ” Peterson Pipes” I£ 55. Amazing. The Kapp Royal 107 with briar inlay also sounds remarkable, but the time period is (at least) in line with the K&P ephemera.